The real crisis in New York State, as it has been in the demise of so many governments over the centuries, is bad, immoral, even evil leadership that doesn’t respect God or obey His Commandments. If leadership doesn’t respect God’s Word, what hope do we have of ever being heard as citizens? Such is now the situation we find in New York State. In spite of all the past errors and abuses, sins and degradations of life in NYS, the most recent is quite telling, and needs to be told. Last year, as the reader may well remember, Governor Andrew Cuomo flexed his “I’m the boss” muscle and tried to ram down the throats of NYS residents a gross expansion of abortion. The Assembly caved, and the Senate almost did the same, except for some particularly brave and committed senators. (A future post will show who said yea or nay). For perspective, one should remember that NYS is widely seen as the abortion capital of the United States. Governor Cuomo’s legislation (which he claims to have personally drafted himself, apparently infringing on the rights of the legislature) was principally targeted at allowing abortion up to the time of delivery, of allowing non-physicians to perform abortions, and giving no protection of conscience rights to those who see such legislation and its spawn as fatally compromising their own souls! 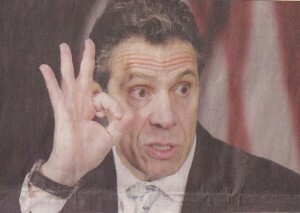 Governor Cuomo tucked his abortion legislation into a 10-point document for which the first nine points were almost trumped-up tweaks of “women’s rights.” He likes to use misleading titles (like the name SAFE Act to mask infringement of 2nd Amendment rights) so it is not surprising that he would dub the disguise for abortion as the “Women’s Equality Act.” Most people of fair mind would see that abortion has nothing to do with equality! Men are not having abortions, are they? If Governor Cuomo really (REALLY!) had cared about his first nine points (the ones disguising the 10th and abominable part) he would have accepted that the Senate did pass the first nine points and signed those into law. The 10th point, the abortion plank, failed in the Senate, by ONE VOTE. Why didn’t Governor Cuomo settle for getting nine out of ten? Because he has to win everything no matter how so many other believe? Or because the first nine points were really only a disguise for expanded abortion? If he had accepted those nine to pass and be enacted into law, he would have lost the disguise for the wild expansion of abortion. So, instead of accepting what he had argued women so needed, he left them and those nine points hostage to what seems more like a tempter tantrum than responsible governance, in my opinion. Now NYS must face the battle again, while trying to protect its very soul (not to mention the souls of legislators who are duped, pressured or trampled into voting for such appalling legislation.) On Monday, January 27, still in the afterglow of a successful 41st March for Life in Washington D. C., we learned that Cuomo’s legislation was again passed by the Assembly. It is poised to go to the upper chamber, to try to accomplish what couldn’t be done last year. We don’t know the exact date this will happen, and there will doubtless be much misleading information and then a surprise session (that seems to be how Governor Cuomo’s ALBANY does things), but that is no reason for us not to be prepared, to do all that we can to secure the human rights of the unborn, beginning with prayer. It is a sad world that keeps up such an onslaught, but that is how evil works. Keep an eye on this blog to learn more about events, especially in Western New York, where we can do our part to give honor and glory to God, the source of all life, even the lives of those who hate life so much that they want to murder in the womb.